I made it. Day 2 salad is prepared, photographed and devoured. If I had not pledged to make seven salads I would not have made this delicious winter creation today. Mondays are BCCDC days where I manage to be at work by 8:30 am and spend the entire day furiously reading about and writing my new research proposals. I usually finish around 6:00 but today I had to take the bus after to UBC to tend to an ongoing experiment. On work filled days such as this, I usually defer to letting the sushi professionals feed me. Instead, I left my new work early so I could be at my old work by 5:30 then back home by 7:00 fully mentally prepared to whip up this salad. I found an intriguing white grapefruit at Whole Foods over the weekend and was unsure if it was worth trying out. It was large but very light, suggesting it did not carry a lot of juice. I suspected, once sliced open, that it would reveal a very thick pith. I was right, but the small centre was surprisingly juicy and the segments delicious and refreshing. I settled on simply tossing the arugula in lemon juice and olive oil after reading through my newest cookbook, David Tanis's The heart of the artichoke. This is a wonderful cookbook that doubles as a beautifully written story book filled with tales of the chef's past, some history behind the food combinations used and offers tons of simple and unique ideas. I love this book for its simplicity. I often am a little spastic when it comes to combining ingredients, I like so many things it is hard to limit a dish to just a few ingredients. So a cookbook that inspires me to dial it down a notch is always well appreciated. One section that I enjoyed reading was on the topic of arugula, how it has become a symbol of elitism and is now strangely overused. He summarizes some traditional and simple uses for arugula around the world as well as as the numerous names given to arugula including the word 'rocket' which I love. He describes how in Milano arugula is served by simply tossing the leaves in lemon juice and olive oil. Arugula is so flavorful on its own it seems silly to try to compete with its taste using a complex dressing and so I went with this recommendation. 1 - Preheat oven to 375F. 3 - Spread fennel on baking sheet and roast about 20 minutes, turning once half way through cooking. 4 - Section out grapefruit segments, reserving juice. Stir in chopped fresh mint. 5 - Bring 1 cup of water to a boil, stir in 1 tbsp of olive oil and 3 tbsp meyer lemon juice. 6 - Remove from heat and stir in couscous. Cover and let stand for 10 minutes. Fluff with fork. 7 - Whisk together remaining lemon juice with reserved grapefruit juice and an equal volume of olive oil. 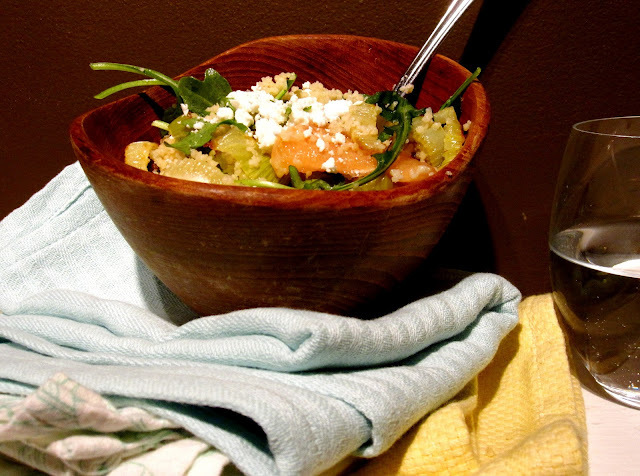 8 - Toss arugula in dressing and mix into warm couscous, allowing arugula to wilt slightly. 9 - Serve couscous and arugula mix topped with roasted fennel and grapefruit segments. 10 - If desired garnish with fresh goat cheese and some almonds or other nuts.